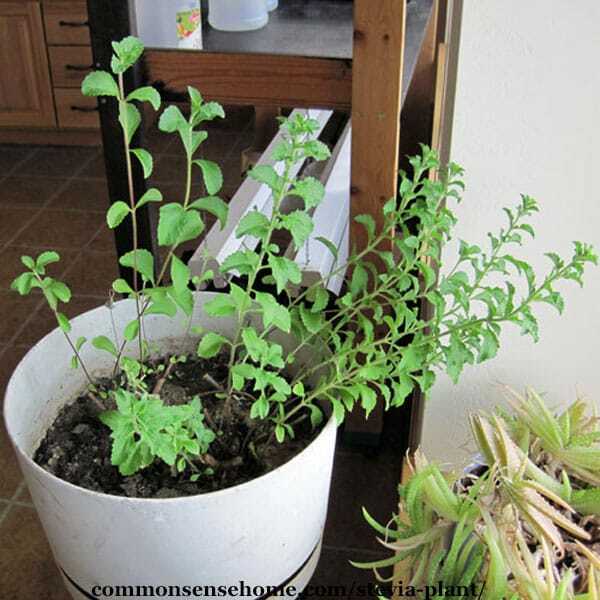 Stevia plant, or sweet leaf, is an alternative to sugar that you can grow in your own garden. In this post we’ll cover a little background info on stevia, growing it from seed or starts, harvesting and using the leaves and making stevia extracts. Also known as “sweet leaf” or “sweet herb”, stevia has zero calories and no impact on blood glucose levels. It is native to the altitudes of Paraguay and Brazil in South America, and has been used as a sweetener for hundreds of years. Traditionally, it was used to sweeten teas, and for its medicinal properties. Refined stevia products are available for a more standardized sugar substitute, but with a little creativity, you can use dried leaves or extracts in many different recipes. Stevia rebaudiana is the sweetest variety and most commonly grown as a natural sweetener, but over 100 species of stevia exist in North and South America. The leaves contain up to 5% dry weight of stevioside, a sweetener estimated to be up to 300 times sweeter than table sugar (sucrose). Whole sweet leaf contains 11 major steviol glycosides, which range in sweetness from 50 to 400 times sweeter than sucrose. Unlike some artificial sweeteners, the sweetness of stevia is stable in high temperatures. Full sun, with over 15 hours of light preferred to maximize vegetative growth. In areas with hot summers, light afternoon shade is beneficial. Well drained soil or potting mix. Raised beds often work well for these plants. Compost or organic matter in the soil – skip the chemical fertilizers, which can cause lush growth with lower amounts of sweetness. Over fertilized plants are also more prone to disease. Consistent soil moisture. Wild stevia tends to grow near bodies of water, where soil is moist but not waterlogged. Organic mulch can help keep soil moisture even. Room to grow – plants grow 1-3 feet tall (shorter in cooler areas) and roughly as wide. Use a one foot or larger diameter pot, or space plants 18 inches apart in garden beds. Frost protection – plants may overwinter in hardiness zones 8 or higher. For colder climates, bring plants inside before hard frost if you want to keep them from year to year. Stevia plants are now available at many garden centers or through online nurseries and retailers. If you’re selecting plants in person, look for those that are compact, with tops roughly equal to or less than the size of the pot. You also want good leaf color and no obvious signs of stress, like brown leaf tips or dry soil. I’ve had good luck with starting plants from seed indoors and transplanting out to the garden. (See below.) You can grow many plants from seed for the price of one nursery plant. Click here to order plants online. You can pick leaves as needed, or cut the plant back by half in midsummer and early fall. If you want to keep your plants over winter, leave at least 6 inches of plant intact to allow regrowth. Cut back plants to force foliage growth if you see any signs of flowering. When growing stevia plants inside (or outside as the days shorten), less than 14 hours of daylight per day is likely to trigger flowering. There is some sweetness throughout the entire stevia plant, but the leaves are much sweeter than the stem, so the stem is typically discarded. You can cut off the desired stems from the plant and bundle them in small bundles (less than 1 inch in diameter) and hang dry, and strip the leaves after they have dried. Alternatively, you can strip the leaves off the cut stems and dry them in a homemade or commercial dehydrator on low heat. Dried leaves will keep well for several years stored in a tightly sealed glass jar, and can be ground in batches as needed for recipes. Here's a bundle of leaves harvested from my stevia last fall. If you look closely, you can see that the leaves and stems are somewhat fuzzy. You can chop and tear the leaves and add them directly to tea blends, or make a stevia extract as directed below. Making stevia leaf extract is easy. You can use fresh or dried stevia, although I've read that extract from the dried leaves tends to be more bitter. I prefer alcohol based extract, since it has a longer shelf life. Start with clean stevia leaves, either fresh or dried. I rinse off my fresh leaves and give them a spin in the salad spinner. Chop the stevia leaves. Place the chopped leaves in a glass jar, and then pour in enough vodka to cover the leaves. Label the jar and put in a cool spot out of direct sunlight for two days, shaking or mixing gently a few times per day. I put mine in my pantry. Don't let it sit longer to try and get a stronger flavor. Longer steeping can increase bitterness. Don't include stems so you have more material. They don't contain much steviol glycoside, which is what makes the stevia sweet. After two days, strain the leaves through a coffee filter or other fine material. Take the raw extract and cook it gently over low heat. Do not boil it, or it will burn and taste nasty. Simmer gently for 20 to 30 minutes to drive off some of the alcohol and concentrate the extract. It will get darker and a bit thicker and some particulates may precipitate out. Strain through a filter into an opaque bottle (I recycled a vanilla extract bottle). Tincture bottles with droppers are great if you have them available, as it only takes a few drops of extract to sweeten a drink or recipe. Cover, label and date. This stevia extract will keep for around three months in the refrigerator. I found this extract to be quite sweet with very little bitterness. Given that the tiny bottles of extract sell for at least $10 each, you can see how going homemade can save money. Bring water to a simmer in a small saucepan. Do not boil. You should see small bubbles only. Stir in dried stevia leaves and remove from heat. Cover and let steep for 40 minutes. Strain out leaves. Pour into a clean glass jar, cover and store in refrigerator for up to two weeks. Yields approximately 1/2 cup stevia extract. This extract is best used for sweetening teas or other beverages. Most recipes call for dried powder or liquid extract so that the flavor spreads more uniformly through the substance being sweetened, but feel free to experiment with fresh leaves. They work well in tea blends, smoothies and fruit salads. 3-4 teaspoons of dried green stevia is roughly equivalent to one cup of refined sugar for sweetening, but you will need to experiment or find a good sweet leaf recipe book, because substituting stevia will change the texture and baking properties of food. Sweet leaf does not have the same properties as sugar for baking. When you’re substituting for sugar, it’s best to start with no more than 50% stevia, and then adjust for taste and baking qualities. Start Stevia seeds much the same as any other garden seeds. Visit my post on starting seed indoors for more details on lighting and tips for success. 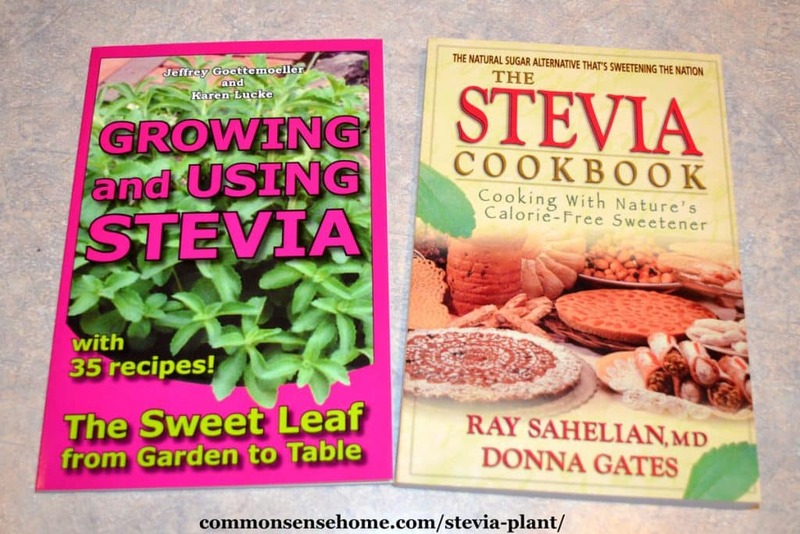 The book “Growing and Using Stevia” states that darker seeds tend to have higher germination rates. The instructions given below are based on those detailed in the book. Seeds should be started inside 8-10 weeks before transplanting outside. Place 1-3 seeds in each cell and lightly cover with fine potting soil or vermiculite 1/8 inch thick. Spritz or mist with water to settle the soil. Place seeds under a clear plastic cover (you can recycle plastic produce containers or use products specifically for seed starting). Use fluorescent lighting to supply light and keep the temperature between 75-80°F. The book “Growing and Using Stevia” suggests keeping the lights on for 24 hours per day at first, then maintaining at least 15 hours of light about three weeks after sowing. Seedlings should emerge in 7-14 days. Remove cover after seedlings emerge to help prevent damping off. When seedlings are growing strongly (have distinct leaves), thin them to one per cell by cutting off weaker plants at soil level. The book suggests only watering from below every 3-5 days so the soil stays moist but not soggy. I watered mine the same as I water everything else – gently from above. A small amount of fish emulsion or other natural fertilizer may be added to the water as the plants grow. When seedlings reach around 5 inches tall, trim 1-2 inches off the main shoot to promote branching. (You may use these leaves for sweetening.) Move the seedlings to 4-5 inch pots. When it’s time to move plants to the garden, harden plants off by moving pots/seedlings outside in a protected area out of direct wind and sun for a few hours each day. Gradually increase their time outside. When plants have had a chance to acclimate to outside conditions, pots may be moved into full sunlight and plants may be planted into the garden. Stevia plants do not tolerate frost, so protect or move inside if temperatures are expected to drop below 40°F if you want to keep your plant happy. Here’s a plant that was dug up from the garden in fall and kept inside for the winter. You can see it is getting a bit leggy due to lack of sunlight. Give Stevia Plants a Try! If you've been thinking of trying something new in the garden, or you use a lot of stevia and would like to save some money by growing your own, I encourage you to give these plants a try. I’ve kept plants growing for several years at our home in northeast Wisconsin. My only regret is that I didn't learn how to make stevia extract sooner and save myself some money. As always, remember to share this post if you find it useful, and leave a comment below with any questions. Did you know we have over 100 gardening posts on the site? They're all sorted by category on the Common Sense Gardening page. We have growing tips for crops from blueberries to peas, season extension, troubleshooting tips and more. Thank you for this post. I grew stevia last year and dried it, but wasn’t sure where to go from there. It’s still hanging in the basement! Dried leaves for consumption can also be purchased from San Francisco Herb co or Atlantic Spice. Check both sites because price may vary according to availability and your physical location (for shipping). Last time I ordered it was a $35 minimum. They ship in bulk. Both dried botanicals and herbs. Some bulk spices and dried foods. They also carry bottles and droppers. Vodka works great with other dried botanicals to draw absolut and i LOVE these instructions. Ya shoulda been a teacher!!! Thanks, Kelly. I do homeschool me boys, and “teach” here. I also acted as an assistant instructor back in college (statistics class -ugh – don’t miss that at all!). Life is learning. My plants are doing great. I was wondering if the fresh leaves can be brewed along with a tea bag to ad sweetness to tea or even coffee? PS: gave up on seeds and bought Bonnie plants. Placing the fresh leaves to brew with tea will work to some extent (not quite the same flavor profile, but there is sweetness). Trying to brew fresh leaves with coffee, not so much – although a French press might be more effective than an automatic drip machine. I also bought the Bonnie stevia plants. They were sold in the herb section at Home Depot in my hometown of New Freedom, Pennsylvania. They were about four inches tall. I planted them in a sixteen inch pot. Within about three weeks the plant were almost a foot high. Now they are about two foot high and look like a small shrub. I’m very happy with my first experience with stevia. It couldn’t be any easier. I made sun tea with tea bags and a sprig of stevia plant….nice. Great post. Visiting from The Barn Hop. I’ve seen so many “grow your own stevia posts” out there but none of them go on to describe how to USE it once you’ve grown it. Thanks much – can’t wait to try out the extract! Can be shade dried, crushed into powder and kept into a tight lid container and used in any beverage as a sugar substitute. Can be used by obese and diabetics. Its sweetness is 1cup of stevia = 300/400 cups of cane sugar depending on the variety of stevia plant. Thank you so much for the helpful info! Just planted my stevia seedling and am looking forward to making herbal teas and extracts. Thanks so much for the information. Outstanding information. I’ve grown purple cone flower for the echninacea but never considered this. A few months back you mentioned a guest post on your blog on self defense but I don’t have an email. You have my email from this, feel free to contact me if you are still interested. My partner is an engineer and we both thoroughly enjoy your blog. Very informative. I didn’t have much luck with germinating stevia seeds, three plants out of 24 seeds is all I got. I’m babying those three plants. Keep those plants growing and you should have plenty of stevia, as they can get quite large. Good luck! Oh yeah – the exact it MUCH easier! The leaves are sweet, don’t get me wrong, but to me they still taste “planty”, which is not something I want in my beverages (or chunks). It’s better to dry some leaves and make a fresh batch when you need it. You can store it without cooking off some of the alcohol to extend the shelf life indefinitely, but then you would taste the alcohol. I’ve also used glycerin (6 parts per 4 parts water)) as the menstruum. It has been stored for well over two years (I made way more than I thought I’d need) and is still good. I tried growing stevia this year, but it didn’t work out. Looks like maybe I didn’t keep the seeds warm enough for them to actually germinate! This post is so helpful! I hope you don’t mind, I shared a link to it on my blog’s Facebook page. I’ve been talking about stevia and a sugar substitute this week. So glad I found this, I just planted my first stevia plants and was wondering how I was goin to use it. Thanks so much for your info. Pat – glad to help. Can I use stevia leaf green powder to make an extract? Yes, you can use the dried powder. From what I’ve read, the dried powder tends to be a little more bitter than the fresh leaves, but so far I’ve only use fresh. I grow stevia and find it impossible to grow from seed. Those darn seeds can be expensive too. One year I tried to root a stem from the mother plant. No matter how hard I tried, it wouldn’t root. I dried the leaves but to be honest, they are bitter. I am going to try your method and make a fresh tincture. Once I let the stevia go to seed and harvested the “seed.” Still no luck getting those darn seeds to take! Thanks for the great post. Anna- Stevia can be a fussy germinator. I make sure to use fresh seed from a source I trust. I haven’t tried rooting a cutting yet, but I may this year since my plants are now two years old. Out of 15 seeds I have one plant. The plant is really doing well and it’s a year old and about 8′ tall. Repotted the plant into a larger pot (3″pot to a 6″pot) towards the end of the summer. Now I know I need to cut the top of the plant to promote the branching, I will do that tomorrow. Looks as if I have a couple of root plants beginning. I am planning a herb garden for the summer and plan to plant more stevia, I will begin the seeds this winter in hopes of having some plants large enough to put into the garden. I had hoped until I read your article that it would spread like a mint plant as the leaves look so similar……yeah I know in my dreams LOL! Yep! Stevia is *not* a spreader like mint, at least not for me, although it will get leggy and sprawl if I don’t keep it trimmed. You may have some luck rooting cuttings from your original plant, if you wanted to try that. I took a cutting from my mother plant and got it to root first time. My method was to sit it in a jar of water and add a small amount of willow water whenever the water level dropped noticeably. It took quite a long time to put out roots (I may have been a bit light with the willow water, but I almost killed it when I first put it in straight willow water), maybe a month or more, but eventually it put out good strong roots. The cutting/child plant is sitting outside in a pot (and a storm) as I write. I imagine any rooting hormone would do the trick, I used willow water as it was free to make and fun. That’s neat. I’ve never tried willow water, as I don’t have any willows handy, but I don’t mess around with cutting propagation too much, either. Thanks for sharing your experience. Yep, Stevia is indeed slow to root — tho I had very little trouble originally starting my crop from (yes, expensive!) seed and really didn’t even do it right lol . . . I imagine having trouble rooting em is bc I’ve had bad timing and wrong kinda cuttings – but even so, have btwn 25 to 50% success rate. I’m guessing (and testing) young new shoots in spring this time (older woody-stem shoots have a hard time in late spring/summer). Another thing to experiment with is direct sunlight v. indirect v. controlled artificial lights. I have some willow bark I collected from a dead willow – I put a little of that in water right with the cuttings. Can’t really tell if it makes a dif ? ? ? The extract only keeps for 2 weeks? Is there anything that can be done to make it last longer? I’ve been wanting to do this, but It seems like a lot of work to only last for a short time. Tangerine – the only way to extend the shelf life is to add some sort of preservative – like alcohol. With the water based extract, you’ve basically got plant juice in a jar. Even though it’s sterilized, it’s only going to keep so long. Your only other option would be freezing, but I haven’t tried that and haven’t seen it recommended. 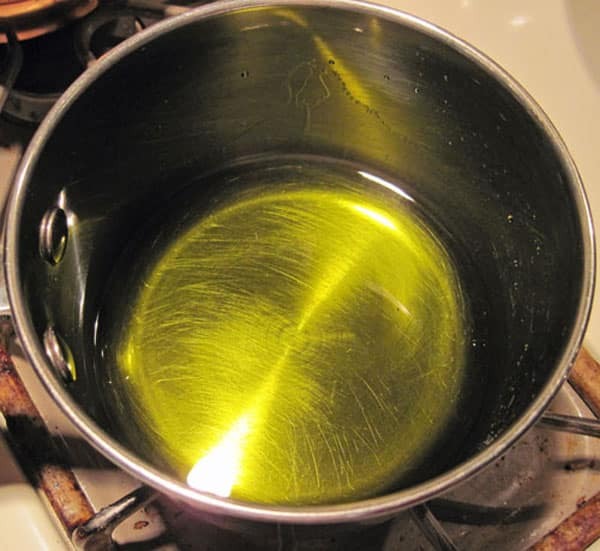 I tincture other herbs (which is what you’re doing when making this ‘extract’) and prior to the process being explained to gently heat this and evaporate the alcohol, you should be able to keep the ‘extract’ almost indefinitely for future use I believe. (This is my first season with stevia to harvest-so this is supposition on my part.) But my suggestion is if you have more than a few ounces, store what you will not immediately use without doing the ‘cooking’ step and process only the amount you can use in a few weeks. It requires more work each time you’re ready for a new ‘batch’, but could extend the shelf life of your extract for some time. I know I am able to keep ‘tinctured’ herbs for several (2-7) years just being aware of smell, color and making sure there is no visible growth that looks like molds. The alcohol is the preservative, so why boil off more than you can use at one period of time? If you aren’t interested in this sweetener for children, and will use it in things like hot tea or coffee, adding it right off, while your beverage is very hot causes most of the alcohol to evaporate anyway. Is it necessary to ‘cook’ it as part of the extract process at all?? or just to get out the alcohol for use? questions…ty . Stevia, unlike many herbs, has an underlying bitterness. The longer is sits in the alcohol, the more of this bitterness gets into the extract. So – you could certainly extend the shelf like by keeping in the booze (I keep my tinctures longer, too), but the taste would not improve with age. Cooking off the alcohol isn’t absolutely essential, but it does concentrate the flavor, so you’re not doing shots of vodka to with your coffee or tea to get the desired sweetness level. Lol! What if I want to do shots with my morning coffe or tea (just kidding). I had heard that lemon & apple are preservatives. Does anyone one know for sure about those options instead of tangerine? I’ve never heard of apple and lemon being used as preservatives. Apples contain pectin, which can be used for making jams and jellies, and lemons contain acid, which can help make foods safe for water bath canning, but I don’t believe either is a preservative in and of itself. Too funny….. you might not make it to work at all and you can blame the intoxicating coffee when your boss asks, hahahaha! I read somewhere (but please verify) that you can freeze the extract. I intend to try that this year. I’ve never tried freezing the extract. I do freeZe it. I cook with water on the stove then pour into ice cube trays and freeze. I make a cup of tea and place an ice cube in it. Works great. oh thank you so very much for all this information! i’m way post gastric bypass, very limited budget, have been growing one straggly plant all while diligently looking for this! now i’m so excited that i’m going to order some seeds to get some more plants going! Sorry I didn’t catch this sooner. I was in the kitchen. It should cook around 20-30 minutes. You’re looking to reduce the volume by about half or so. Watch for the color change, but be careful not to burn it. How dark should it get? I cooked mine on low for 25 minutes, was in kitchen watching the whole time so not to boil/burn it. It got really dark green and has a musky/sharp taste to it. Did I cook it too long? I’ve tried it twice and both times the result was gross. Help! Maybe infuse it for a shorter amount of time before cooking? It should be green, and there will be a slight aftertaste (to my palate, it’s like black licorice or anise), but the aftertaste shouldn’t be stronger than the sweet taste. Unfortunately, plants being plants, there is variability in flavor and sweetness, but I would start with a shorter steep and see if that improves the flavor. Longer steeping tends to bring out more bitter compounds. Can you use this in baking? If so, how would one do that? Thanks for this great post! You could harvest over winter, if the plant is inside and growing well. We go through the extract fairly slowly, so I’ve only done this a couple of times so far. What a great article! Laurie, thank you very much for sharing this information with us. Today, I bought my first stevia plant with the intention of planting it a in pot to hopefully harvest it all year around. I will most definitely follow your instructions. Good luck! I hope it grows well. I bought a stevia plant two years ago and keep it in a container (it’s up to a two gallon pot!) and I bring it in during the winter. This year I put it in a southern window and it’s going bonkers. It loves it. I’m watering once a week and can harvest every month, even when it’s 0 degrees outside and snowing. I make tinctures of all my herbs for medicinal purposes and use vodka as the medium to draw out the properties. These tinctures last for years so I have believed that stevia tincture would be the same. The only processing difference is that my tinctures are left for 6-8 wks instead of two days and there is no cooking at the end of it. Do you think this would work for stevia too? 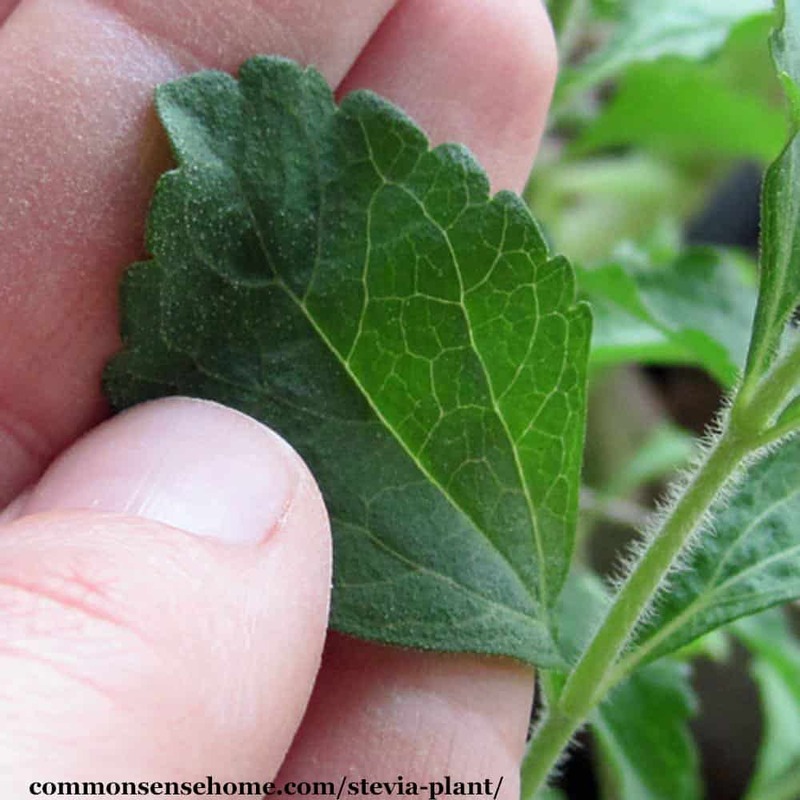 Don’t leave the stevia to steep longer, as it will bring out the bitter compounds. If you don’t cook off the alcohol, if will indeed have a much longer shelf life, but be much less sweet. I wondered about the long term storage as well. So if we only cook the alcohol off when we need a new batch it would work. I’m not sure how the flavor would change with extended storage. I’d definitely take out the plant matter so it doesn’t get bitter. this is awesome! i planted 3 stevia plants and two survived. I wish i saw this sooner to know to cut back for more sprouting. so after harvesting you dug yours up and brought them in and put them in a pot? or did you let them dry out and replant them? i know, silly but I’m new at this and want to keep these plants going. Dig up and pot and bring inside. Once they turn brown, they are usually a goner. How well and how long do the dried stevia leaves retain their sweetness? I’m thinking that maybe hanging the plants upside down in a dark place & letting them dry naturally, then making the extract a batch at a time, would be the way to go since the shelf life of the extract is so short. Depending, of course, on how much you use. Have you ever tried making the extract from dried leaves that are a year old, for instance? I haven’t tried making it with dried leaves yet, so I can’t compare the tastes personally, but a number of sites do recommend using the dried leaves. Most herbs keep their quality pretty well during the first year. I’d say give it a try – you’ve got nothing to loose. I’ve grown stevia before, but was at a loss as to what to do with it. I harvested this year’s plant today and am looking forward to the finished extract in two-day’s time. Thanks for sharing this post as I haven’t found another that is as informative and useful as yours. You cook off most of the alcohol in the last step, so it really just tastes sweet. The flavor is not quite the same as sugar. Some people like it, some don’t. Stevia is Great! “You will absolute like Stevia leaves If you like herb”. Well isn’t this timely! I have been meaning to investigate how to prepare my stevia for storage ever since I noticed how popular it has become (as in, those squirrels and chipmunks sure do have a sweet tooth!). You’ve saved me the effort, and given me an idea. I think I’ll try making the water based extract and freezing it into little tiny stevia-ice-cubettes. Maybe with a little lemon juice…yup, sounds like a plan! Ooo, that’s a good idea! How did the freezing work? I freeze all of the herbs I grow and find they taste much fresher than dried. Very curious to know if this works with stevia! I grew stevia this summer however only two plants made it. They are big and healthy. Will stevia survive if it is brought into the house for the winter? My plants are in a container so they would be easy to bring in. Thanks for your article. Yes – they should survive inside. Mine did. I moved it back out this summer and it looks good. Stevia survives down to about 20 degrees Fahrenheit at night in winter greenhouse here – preferring less hours of direct sunlight in high altitude desert climate. It seems to need more water than most other plants. It flowers in wintertime here. I continually cut back flowering tops, dry em, and use directly in my campfire-style tea. Toward end of winter (which is beginning of spring in most places) they turn brown and die off above – at which time I cut off allah last yr’s mostly brown stalks and soon after that they start growing fresh new shoots from the roots. I have an exposed lower level in my home, so the plants that come inside from outside live downstairs while other houseplants live upstairs, but certainly you should do what works best for your situation. Laura, I am having trouble “bookmarking” your page. Any tips as to how I can “save” you? Wendy – how are you accessing the site? I don’t use mobile devices, only a PC, so it’s hard for me to check what happens on those. A friend of mine said she couldn’t Pin some posts from her mobile, but could from her PC. How are you trying to book mark, and what error messages are you getting? I’m not very tech savvy, but I’ll see what I can do. I was thinking that stevia was a perennial. I am so glad I read this – now I know that I definitely need to harvest it this weekend. Stevia is a perennial, it’s just not cold tolerant, so I have to bring mine inside here up north. I’m in N. GA but my stevia in a pot seems happy in my kitchen even if it is getting a bit leggy! I had so much trouble getting seed to sprout I decided to dig it up and bring it inside. I almost killed mine just like that. We’re heading into winter #2, so I wondering how it will hold up. I think if you could get the seedlings established outside the bale first, and then maintain adequate moisture in the bales, they’d probably be fine, but I wouldn’t try direct planting as the seeds can be a little fussy to germinate. Only one way to find out for sure with the conditions you have, but it’s a fairly inexpensive experiment. I was wondering how to convert a recipe from sugar to your stevia extract. Does it change the texture? It will change the texture and volume of the recipe, because it doesn’t brown like sugar and you are loosing some bulk provided by sugar. The bulk or consistency that sugar normally would add can be replaced with applesauce, fruit puree, canned pumpkin, fruit juice, yogurt, or any ingredient that will taste right with your recipe and add moisture. For everyone cup of sugar that is replaced by stevia 1/4 to 1/2 a cup of the bulk should be added. That’s a really good question. I went back and double-checked the e-how article that is referenced, and it doesn’t say. I suspect you are correct. I’ve only used the liquid for sweetening. I haven’t yet attempted baking substitutions with the dry leaves. Tried your recipe. Very easy but didn’t find that it got thicker. I also tried it with putting some sticks of vanilla in it. I think you might have to take out the leaves at day 3 and keep the solution with the vanilla for awhile. I also did it with lemons and that has a great smell. Funny thing is I dried the leaves after I used them and they don’t seem as bitter when you try them. I might grind them and use them. If you want to keep the stevia alcohol in lieu of cooking down for longer shelf life, then how do you think you can use it. I guess it is like vanilla extract. Suggestions? Also, most site suggest dried leaves. I wonder if anyone here has tried both? Cooking the liquid is primarily to drive off the bulk of the alcohol and concentrate the sweetness. It will not produce a syrup. Straining the leaves before flavoring seems like a reasonable idea. I haven’t experimented with keeping the high alcohol content. If you try it, I’d be curious to hear how it works for you. Where do you buy stevia plants? Some nurseries are starting to carry them, but I usually just start mine from seed. Which type stevia plant is the sweetest? Most stevia plants available for sale are simply labeled “stevia”, which no differentiation based on sweetness. Last summer I found stevia in a local green house and promtly bought seven plants. Then I came home and found your site to learn how to make stevia liquid! Been a follower ever since. Love your site and turn to it often! Just wanted to let you know that my stevia is blooming now and I am wanting to harvest the seeds. Have not harvest seeds before and was wondering when to pick them off the plants? Thank you for your post on stevia. This is the first time I have grown stevia in my garden (in a big pot). My stevia started out great. Looking very thick and green. Now it’s suddenly starting to look leggy and leaves are browning. There are little shots of new growth on the top of the stems. I don’t know if that is new growth or it’s going to seed. So far I have only been picking off a few leaves. I haven’t actually trimmed any stems off yet. Can you help ? I haven’t changed the watering schedule. Should I trim it down for fresh new growth or is it too late ? (It’s only mid July !!). Please help !!!! Thank you so much ! I am curious if you are getting future seeds from the blooms in the Fall. I didn’t, but you can. I just potted my plants and moved them inside. We have a farm. I have grown stevia before. It’s very easy, but it doesn’t like really cold weather. We would bring the giant pot in each year when temps dropped. Cats are REALLY attracted to it. My cat was like some type of drug junkie with the sweet leaves, so I taught the dog to guard my plant. 🙂 I will start some new plants this year. That’s interesting. My cats don’t bother mine, but then again we have an abundance of catnip in the garden and dried inside for winter, so perhaps that helps. Dried stevia leaves are better than powder, because the powder is harder to filter out. Follow the same process, using dried material instead of fresh with enough vodka to cover. If you only have powder, I’d use less powder and more vodka. Great post! I’ve grown stevia a few times as the plant but never had much luck in growing it. I may try the plant again and try bringing it inside (good idea!) and see what happens. Thanks! I was very glad to find this article. I’ve had a stevia plant in a pot on my deck for several years. It dies over the winter but comes back in the spring. We only have a few days/nights below freezing in the winter. I could never find out how to get usable sweetener from the leaves, but someone told me last year that I should steep it like tea. So I’ve steeped about 1/4 cup fresh leaves in 2 cups water that I brought to a boil then poured over the leaves. I left the leaves and water in the jar and refrigerated it after it cooled. I have only used it in my morning tea, about 1/4 cup in 2 cups of tap water which I bring to a boil then pour over tea leaves. It sounds like the water based extract made with dried leaves will produce a more concentrated sweetener. What are your thoughts on this? I think the water based extract should indeed produce a more concentrated sweetener that might be a little easier for people to use and store, but the simple tea sounds like a fine idea for some uses, such as sweetening other teas as you have done. Sorry for the slow reply. We were out of town for several days. Just bought stevia plants today. If they all live I would have eight to sixteen plants once they are divided. 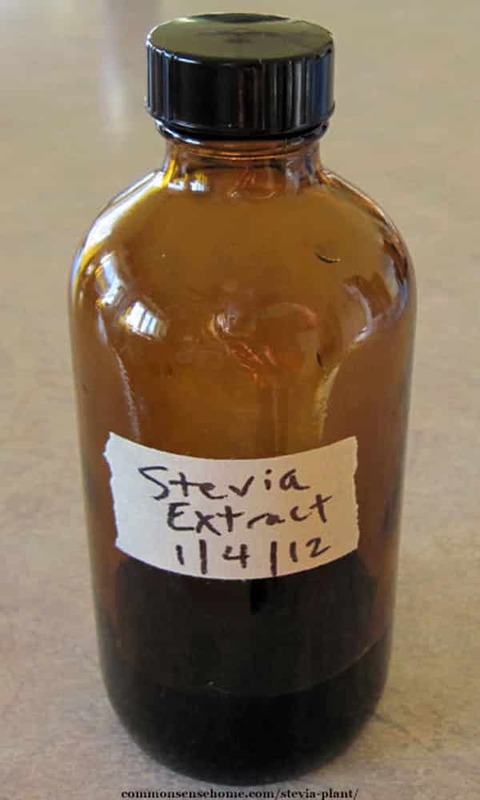 Since I may have so much stevia Is it possible to can the extract. Not that I am aware of. It would be low acid and low sugar, so would require pressure canning. I think you’d be better off to dry the leaves and make extract as needed. You can dry the stevia and use a pinch of dried stevia per cup of tea, two pinches per cup of coffee (coffee has high acid content). For coffee you can put right in with grounds when brewing by the pot. For tea, add to loose tea when making by cup or pot. I also make the extract but I let it steep for 4-6 weeks, then strain it and bottle it. The alcohol preserves it indefinitely. Good point! I have six plants that are all very large. Every day I chop leaves ans steep them with my decaf green tea for iced tea. Sometimes it takes a LOT of leaves for a little sweetness (2 – 3 whole branches).for 2 quarts. I am so glad I found this article, specifically this note, to dry and make extract as needed. Our Excaliber just came this week! So, this will be the first thing we dry in it. Thanks for all this info! Angie, (or really anybody who knows) hope you get to read this and let me know your answer. I’m curious to know if you go through the simmering process after steeping the stevia leaves in alcohol for 4 to 6 weeks? Also, I read somewhere else that 100-proof vodka or rum is used to make the alcohol-based extract, but I only have found 80-proof. Does it make a difference? Thanks for any replies. I wouldn’t steep the stevia that long because longer steeping is supposed to bring out the bitter compounds. I have not tried it because of this. You do not have to go through the simmering process – it simply concentrates the sweetness. 100 proof will draw out different compounds than 80 proof alcohol, but most of the discussions I have read concerning this indicate that the higher alcohol concentrations often bring out more of the bitter compounds. I’m confused: if you don’t go through the simmering process, does the alcohol remain in the tincture? I thought the point of simmering was to cook the alcohol out? My stevia plants are growing great, it’s the harvesting I’m having problems with. I’ve tried both methods on your site (water & alcohol) and neither have turned out right. I’m not sure what I’m doing wrong. The water method resulted in liquid that was barely sweet (2 teaspoons to sweeten my cup of tea). I used leaves that had been drying for over a month….maybe I dried them too long? The alcohol method resulted in dark green, foul-tasting stuff that I threw out. Not sure what I did wrong here. Natural plant material can vary from plant to plant, so it make be helpful to up the concentration in the water method. When you say “foul tasting”, do you mean bitter or rotten, or some combination of both? Rotten shouldn’t happen, but bitter might mean that it steeped too long. With the alcohol method, the simmering reduces the alcohol to concentrate the product, but shouldn’t eliminate it completely. Oh I wondered how you would use the dry. I have ground it but it wouldn’t dissolve. I never thought about putting it in a tea bag to use. Yup! Think “tea” instead of standard sweetener. I may have missed it here but is there a way to create a powder from fresh stevia like you buy in the store? That I am aware of, there is no way to create a white “sugar-alike” stevia product at home. Those sweeteners have been chemically processed, bleached and refined. To create a green stevia powder, you can dry the leaves and grind them, but that’s best used in baking or cooking. It will not dissolve in water. That is a brilliant idea..
Alcohol extracts will last indefinitely as long as the alcohol does not evaporate. Of course you more than likely would be using it up pretty quickly. The simmering is unnecessary. it until I found your site. Thanks so very much for all the information. I did the same thing when I first started growing it. I dried some leaves, but this is much easier to use. 🙂 You’re welcome. Great post – Thank you for the info. I bought my first Stevia plant a few months ago and now have 7-8 plants from taking a clipping and putting it in a boston market cup filled with water and miracle grow. The roots sprout in a week and I plant it in a new pot. Can’t wait to harvest the leaves and make the extract! Without testing there’s no absolute way to tell the alcohol content. Using the water based concentrate would probably be safer under those circumstances. I bought a Stevia plant in June. I planted it with some flowering plants in a round clay planter. It made a beautiful green background with my flowers. I just made my first water based extract today from dried leaves. Can’t wait to try it in my coffee tomorrow! I am in south Georgia and we have had plenty of rain, so it has really grown. Send rain this direction! Our area is really hot and dry right now. Great article!! And easy to follow instructions. I made my first batch of alcohol based extract with fresh leaves yesterday. This is the second time I’ve grown stevia and I was determined not to lose my plant this year before I figured out what to do with it. It came out great!! No bitterness at all! I’m going to make another batch with some lemon infused vodka I made a while back and use it for iced tea. I shared this link with my recipe group since I know a few of them asked about it when I mentioned I was thinking about trying it. The lemon combination sounds great! Thanks for sharing. I’ve only steeped mine for the time range shown in the post. It’s my understanding that longer steeping may draw out more of the bitter compounds, but I have not tried it. As for the coloration, there may be slight variations in the plants themselves and/or the light exposure in the photo. I wouldn’t be concerned about the color variations. BTW, as a side note on sugar free canning, sugar does help preserve the color and texture of the fruits by binding some of the free water in the fruit. Sugar substitutes do not have a similar binding effect, so fruits are likely to darken and get mushy more quickly than if some sugar or honey was used in the preserving process. The Natural Canning Resource Book is a great reference for canning without sugar and using sugar substitutes. Thank you very much for all the great information! This is perfect in didn’t know I could bring it in and replant. So excited to try this! Thank you for the start to end information most site don’t start with seeds. The plants in these photos are still going strong for the third summer (I think it’s been three). When they get to leggy or start dying back, I clip them down to nubbins and start all over again. Hello! I just found this website for the first time, and your time and attention to this information source is absolutely great. If you don’t know something for a fact, you do not try to b.s. yourself and act as if you did know everything! This is such a refreshing approach, and I admire you for your honesty, As for the stevia, I am determined to harvest more this fall, and maybe this time, I won’t kill the plant with kindness. It’s pretty much impossible for one person to know everything and anyone who pretends otherwise is just full of hot air. I do have a well trained google and a substantial reference library, so that helps. If it’s of any use, I’d like to note that I’ve cut my plant back to nubbins three times now since it’s been potted, and each time it has regrown into a full, bushy plant, so don’t give up on it even it if appears dead. Hello, I just made this just like how you made it and it kind of taste like grassy. Have you had this problem? I let it simmer for 25 minutes. I added vanilla powder to mask the taste but have not tried it in my coffee yet. It will taste sweet, but it’s not going to taste like sugar. There is a definite plant taste to the extract, although it is more or less pronounced depending on your palette. Thank you for the info. I live in a northern climate and now that I can bring them in I will. My plants are starting to go to seed. can i use these seeds to grow more plants then cut back and start plant over again? Thanks for your help. If they cross pollinate, you may have viable seed, but stevia seeds are notorious for not sprouting. It’s worth a try if you like, as you have nothing to lose. I have cut mine back to the ground for several years now (when I brought them in for the winter) and they grown back each time. Stevia are heat loving and do not tolerate frost. Frost killed leaves will not make a good extract. If you can move the plant inside, do so, and trim it back to the ground. If it’s not completely dead, it will resprout from the roots. You can harvest once it gets enough good sized leaves – no need to wait for it to bloom. I live in NC and have 4 stevia plants myself. i bought them to get started. I haven’t had any luck with seeds germinating. Besides, my 4 plants give me enough leaves that I usually have some left from harvest to harvest. I make the alcohol based liquid stevia and find that 1 tsp will sweeten my glass of iced tea or cup of coffee nicely. I haven’t tried it with baking. I dehydrated and stored my leaves in glass jars. If I make a quart of iced tea, I add 2 or 3 dried leaves and allow to steep overnight in the tea. The longer it steeps, the sweeter it tastes. I can do this per glass also. I have ground some leaves to powder but it doesn’t dissolve at all. As far as my plants, at the end of the season, I cut back my plants about 3 inches from the ground. I have them in a raised bed. The first year, I covered them in plastic, but the 3rd and 4th year and this year, I just covered them with leaves. Up until this point, I haven’t had a problem with them growing. Thanks, Beth. Because the dried leaves don’t dissolve, I find the extract much easier to use overall, or as you said, steeped whole leaves. Hi this is great thanks! I just wanted to ask if you knew how long the Stevia water based extract lasts (in refrigerator) and why does it have to sit for two weeks? It sits to infuse the flavor in the solution. I’d try to use a water base within a month, and watch (and sniff) for any “off” colors or smells. Alcohol acts as a preservative. Hi Laurie. Like they all said ‘Great post’. I am a type 2 diabetic with a sweet tooth, and am certainly interested in a sugar substitute. I have just bought my first Stevia fluid in a 50ml bottle and feel sure that at €9, it’s more expensive than French perfume. As a pensioner it feels a bit hard on the pocket so I turned to the internet because I was sure you were out there somewhere, and bless you there you were. My question is, as I live in a sunny climate (Tenerife) where we never experience frost and the winters are very mild (around 12- 18 deg. c.) do you think I could just leave the plants outside all year and keep harvesting them? As the plants originated in South America my feeling is I could, but I just wondered if you were from California or Florida I could be wrong. I apologise if this point has already been raised. I read up to fifty posts and gave up looking and decided to ask. If you don’t freeze in winter in the winter you should be good to go. Even here, I just bring mine inside in a pot for winter and put them back outside after risk of frost has passed. If your plants start to look to leggy or rough, you can clip them back to the ground and they should regrow more bushy. Feed them some compost or other natural fertilizer once a year or so. Yes, the extract is a liquid. When you make the stevia extract with just water, it’s sort of like a strong “tea” of the stevia leaves, which you add to your main beverage to taste. Like any herbal tea, it has a limited shelf life, so do store any that you don’t use right away in the refrigerator and use within a week. THis was great information! Like many others I’ve grown stevia for a few years now and the first year didn’t know what to do with it or how to use it. I live in Ohio. I’ve had 3 plants sprout from seed out of many. I got 2 the first year and 1 the next. THe first year I expected to have to re-sprout new seeds the next spring since it is a warm weather plant, but we had a mild winter and IN THE GROUND they overwintered and came back the next spring! I was so excited! So last winter and this, I’ve covered the plants in the ground with a thick layer of straw. Last winter was mild here also, so this year will be a better test. I do have them planted against a brick wall that is south facing, so if there’s sun, it gets full sun most of the day. Another experiment I tried this summer was to divide the oldest plant in half to see if I can create 2 plants from the one. The smaller one that I dug off wasn’t doing well so we’ll see if it can come back in the spring. I have had success from dividing other perennial plants in the past so I thought it was worth trying. We shall see. I have dried stevia that I already ground into powder, so I’ll have to try the extract that way until next summer. I did try making a tea, but let it sit too long and it got VERY bitter and I had to throw it away. I’ve also tried putting some in the top of the coffee maker with my tea bags for making iced tea. One time it turned out great and the other time, not so great. But I wasn’t sure how much to put in. THanks again! It’s so nice to be able to learn from others’ experiments! Hi Laurie. Thanks for the great article. I will try it tomorrow. Then I will report how it has worked for me. At the moment I use a very pure powder (Reb-A> 97%). I think especially for tea homemade Stevia Extract is perfect. When you use vodka to make the stevia extract, is it still considered a calorie free or low calorie sweetener? How much of the calories from the vodka remain in the final product? I’m not certain how many calories remain (I’ve never been a calorie counter), but you only use a very small amount for sweetening – a few drops. Given the tiny volume used, it must count as a low calorie sweetener. Please remind people not to use “Rubbing Alcohol” !!!! My husband just asked me what I was going to do with the huge plant out back in our yard. Now, we know what to do with the stevia plant. I’ve have the drying the leaves under control as I already dry, leeks, green onion, chives, chili peppers, garlic, various basil, (globe is my favorite), sage, peppermint, catnip, parsley, etc. Mmmm, delicious! Thanks so much for the information and your knowledge; it is appreciated. I’ve worked to your instruction, with fresh leaves; it just tasted nice and sweet. However, putting it into the coffee, gives a strong bitterness to the drink; have tried everything from dried/powdered/fresh/water-solution/vodka-based, leafes but nothing seems to work; either it tastes too ”planty” or it increases a bitterness – especially in coffee. Any idea how to vercome this bitterness? Your advice would be appreciated, since I have 3 large stevia plants growing here in Spain, and would love to use them. I’ve largely stopped drinking coffee, because it’s hard on your adrenal glands, but in the comments of this stevia post at Real Food Forager (http://realfoodforager.com/stevia-is-it-as-good-as-they-say/), a reader mentions that they sprinkle the dried stevia leaves right on top of their coffee grounds when making their coffee. At the very least, it would be simple to try. Thank you for this post, I am just starting into using Stevia and am excited for the adventures ahead. Sorry for what may be a dumb question, but I do not drink alcohol and so I have no idea where or how to buy the vodka you use in your extract recipe. Can you please let me know how to know what to buy, where to get it, and perhaps an estimate of what I should be paying for it. Additionally, since the vodka would only be used to make extracts, how long will it keep? Vodka in a glass bottle will keep indefinitely. Remember, alcohol is a preservative. You can also buy fairly small bottles. I just buy larger ones because it’s cheaper per ounce and I use it for extracts and tinctures, and it keeps forever. Many grocery stores (at least in our area) have a liquor department. Otherwise just check the yellow pages or google “liquor store”, or asks friends who do imbibe where they recommend shopping. Here in Oregon, no hard alcohol sales in stores, you must go to a State “Liquor Store” for buying vodka, etc. I’m so excited to see how this turns out. The leaves have been in the jar for 24 hours so far. I just went and bought 4 baby stevia plants for about $2 each. I took all the leaves off and got started. I’ve run out of stevia and I refuse to pay $8/box of “organic” stevia that really isn’t organic or resembles stevia. Fingers crossed this is a permanent replacement. Interesting article, I have one question. What is the advantage in using alcohol extraction over water? The alcohol can extract different compounds than water alone. the root. It came back really nice this year. I live in BRITISH COLUMBIA CANADA the winters can get very cold but not always i just bring the plant in for the winter. process. I am diffidently going to try both. I hope you find a flavor that works for you. I dug around looking for clear indication that stevia could tolerate salt exposure, and in a potted herb listing at Garden Harvest Supply, while they clearly indicated a number of plants that are salt tolerant, stevia was not one of them (although it was listed for sale). Thank you for this wonder article. I am just learning about growing stevia and am interested to harvest and use it as stevia is the only sugar I use currently for myself. Thank you for the tutorial I am very interested in growing steveia as my nephew and a few of my friends are diabetic. I have gotten my herbal seeds from “LeJarden De gourmet” in the past. I have recently found a fantastic place for all types of seeds. at ” botanical intrests .They are from Colorado but ship everywhere. ALL SEEDS ARE NON GMO . and many are heirloom too. Lots of people like mountian rose herbs. I do like their herbas and teas. I prefer Glorybee foods ( out of Oregon) for my castille soap, it smells better and is thicker. Glorybee also has tons of things for folks that like to raise bees. There is at least one seller offering live stevia plants on Amazon, but reviews have been mixed. You may be able to find them at some garden centers, or via mail order nurseries that sell live plants. 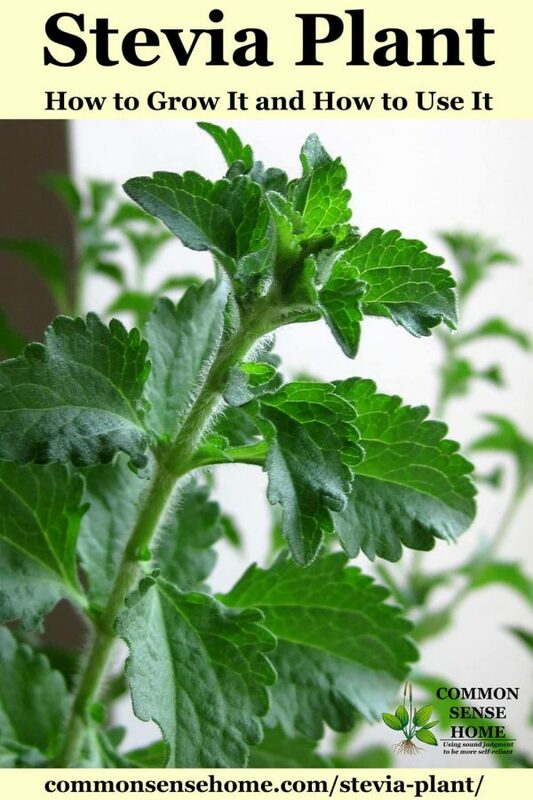 -just a couple of comments about stevia…. (I’ve been growing it for some 12 years now). 2. Stevia, being a perennial, doesn’t have to be replaced every year ( one of my plants is 6 years old and still going strong). That said, it is very frost sensitive and must be protected from the cold – failure to do so will make it into an ‘annual’. I live in N. Cal, in a ‘microclimate’ that pretty much guarantees several nights w/ below-freezing temperatures. My stevia plants do fine as long as I remember to take a couple of critical precautions when frost is predicted. The first, most obvious, is covering the plant completely- I’ve used ‘frost-protective plant cover’, sheet plastic, and bedsheets, all with successful results (although, if a ‘hard’ frost was predicted I would only trust the sheet plastic). The second, less obvious (but just as important!) precaution is to make sure the plants are sufficiently hydrated! This requires a little more foresight and effort-my plants go dormant in the winter, appearing completely lifeless until May or June. This makes it easy to forget that even dormant, these plants still have some moisture requirement: never let your stevia get bone-dry, even when ‘dormant’. In fact, plants suffering from dehydration are more susceptible to frost damage than are plants that are adequately irrigated. 3. Stevia can’t tolerate lack of water but it hates ‘wet feet’. Plant it in a well-drained location ( or mix) and water it regularly. 4. Stevia is not a ‘full-sun’ plant- not here in N. Cal, anyways. Lots of bright but indirect sunlight during the summer in ‘warm’ climes. 5. If you do have several plants, ‘comparison-test’ them against one another for sweetness and taste -more often than not, leaves from some stevia plants will be sweeter, or less so, than leaves from other stevia plants ; also, some plants will produce leaves that ‘taste better’ (or that leave a less unpleasant ‘aftertaste’) than others. THOSE are the plants you’ll want to propagate cuttings from to give to your friends/family/neighbors. If you wanted to try for a peach extract, I’d start with dried peaches (not treated with sulfites) and dice them finely to try and concentrate the flavor. Cover the diced dried peaches with vodka and let steep for at least 6 weeks – longer is better. Have you or anyone tried putting the extracted stevia/vodka mixture in the dehydrator to concentrate rather than heating on stove? I am so scared of ruining this by forgetting and letting the mixture get too hot. Trying to concentrate it in a dehydrator seems to be making more work than needed. The cooking/concentrating process is fairly forgiving, and you can set a kitchen timer to help remind you to check your mixture. Can you freeze the water based liquid stevia extract? I haven’t tried either, but freezing should work. Fresh leaves would be less concentrated than dried, so you would need to use more. Ok just read this. So with the water based extract you would use dried leaves. That makes sense. I will dry mine then make what I need. Thanks. You can use dried leaves for the alcohol based extract, too. Dried leaves and a fresh batch every few months are probably your best best. Good Article – will try to make some extract. Stevia is super easy to grow and propagate. We grew some this year. 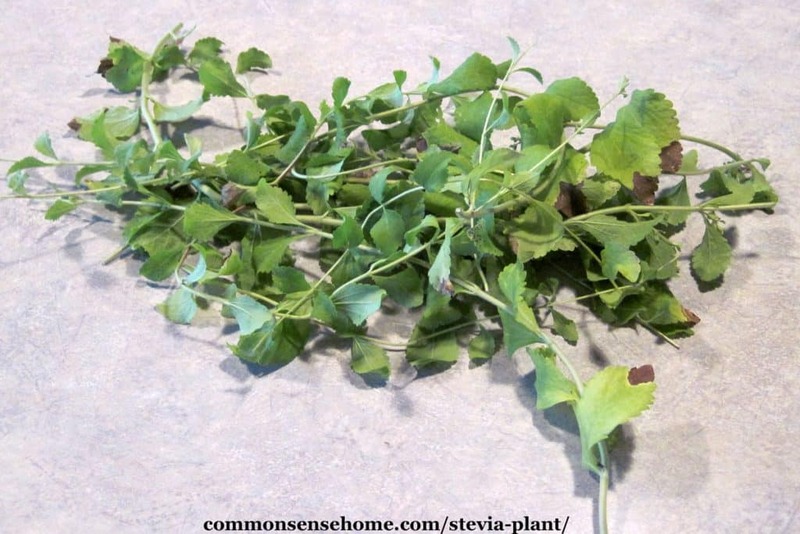 There is no practical way for the home processor to completely eliminate the bitterness of stevia. It can only be minimized in the extract by proper handling. I was curious about making powdered Stevia. I use liquid for most things but for cooking I generally use a combination of powdered Stevia and Xyotol. You can dry and powder stevia, but it will make a green powder that does not dissolve in liquids. The white commercial powder product is heavily refined. How do you over winter them? I get cutting them to 6 inches, but then what? Mine are still in my garden. Had two plants that are now 4 plants. Yes, I’ve overwintered mine for several years now. I have them in a pot, so I just bring them inside. Originally, I moved them into the pot from the garden. In a milder climate (I live in Wisconsin), you might be able to overwinter them in the garden. Thank you for these directions for making the extract. I’ve gotten as far as putton dry stevia leaves in vodka for a couple days. But I began using it right after that because my husband didn’t think there would be a need to heat it. I find that it wasn’t very sweet and I could taste the alcohol. I’m going to try heating it tonight because I think it would be beneficial. The main reason we’re making our own extract instead of purchasing the expensive liquid stevia is because I have yet to find a brand that doesn’t have other things included. It’s infuriating! Prepackaged liquid stevia either has vegetable glycerin or other sweeteners / sweetness enhancers which I cannot tolerate. Sweeteners cause a severe reaction and makes my joints hurt. The only way I’m able to enjoy anything sweet is by using stevia. And when the liquid stevia I’m buying has those other ingredients, it causes the same kind of reaction. I thought I found a good one recently (Sweet Leaf) as it only had organic stevia, filtered water and natural flavor listed as ingredients. Well, come to find out “natural flavor” means inulin in this case. I had awful joint pain after using it! Yes, it’s very frustrating that simple, good food is so hard to find. You think you’re buying one thing, and it turns out to be something else. Hi, I was wondering if you could tell me, I am stewing some rhubarb, can I just throw Stevia leaves in to sweeten it? If you dice them finely, it may give you enough sweetening. Do keep in mind that the flavor will not disperse evenly through a substance as a granulated sweetener would. Ok I haven’t read all the comments so if this is a duplicate question I’m sorry. If you make this alcohol extract it only lasts 3months. The water one 1month. If I make up a lot can it be frozen…. I use drops in my tea but a single bottle lasts me quite along time as I add only two drops. I don’t want it to go bad. Suggestions??????? wonderful article. Thank you soooo much. Are you aware of the history of Stevia in America? I got turned on to Stevia in the 70’s. It was illegal then the sugar consortiums had lobbied and made it illegal to grow or sell. A gentleman in Brownsville Texas told me of his trials and problems with bringing Stevia to us. Yep, I’m familiar with the history – and how things didn’t change much until the big companies wanted to offer refined stevia products. Then suddenly it was magically okay (even though it had been used in other countries for decades). I’ve been growing stevia for years now but haven’t used it much because of the bitter aftertaste. I’ll give using the fresh leaves instead. Thanks. I grow it in pots..just cut it back and put it in a basement window and keep it damp. It gets leggy but comes back when I put it outside. I’ve propagated a few plants by air layering (burying long stem at about half way til it roots). It was worth it at the time after searching for about 5 years and spending $10 on one small plant. Seedlings are now more available. I’ve never completely gotten rid of the aftertaste, but fresh is less bitter than dried. I’ve kept my plants alive for years, too, in a similar fashion. I just recently bought a small Stevia plant. This article came at an excellent time. Thank you so much. I’ve learned so much from you. Thanks for a very informative and inspiring…in that- this I MUST try…article. As a reformed diet soda drinker I have been searching and searching for something to satisfy my love of sweet drinks and I’m so hopeful this will be the answer. I’ve been down the road with all the processed so called “natural” sweeteners, only to learn they are all with negative issues. I’m hoping to find some plants to start in Tucson, Az. Someone mentioned Home Depot?? I will begin my search there. Many, many thanks for inspiring me!! I grew Stevie for the first time this year. I’ve enjoyed it in my hot tea almost every night. Many times I include fresh spearmint also. I still need to add a tiny bit of sugar though. Going to try making the extract for winter. Thank you! How many leaves should I put in my smoothie if I’m using the fresh leaves? Because of variations of plant sweetness, leaf size, smoothie size and personal taste preferences, it’s impossible for me to give a specific number. I’d suggest starting with a small number of leaves, then adding more (or less the next time around) to taste. No problem. You’ll be receiving the confirmation email shortly.